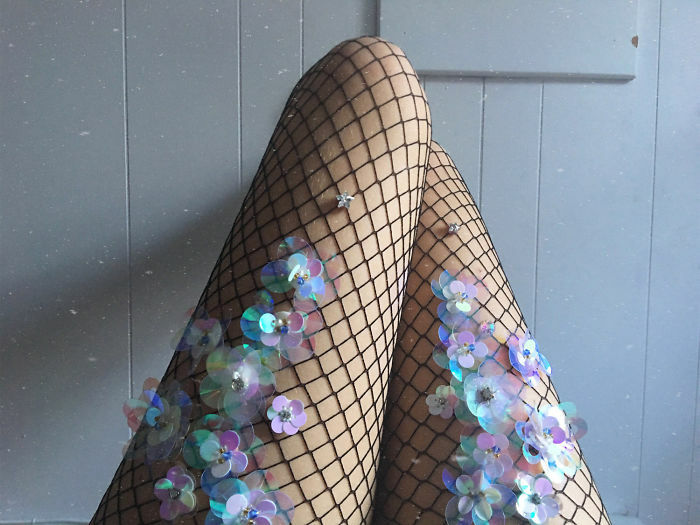 If you love fishnet, and sparkling like a magical mermaid queen, I have wonderful news for you — there’s an Etsy store that specializes in the most spectacular embellished fishnets that you’ve ever seen. LirikaMatoshi is the name of the Etsy shop where you can find these fishnet (and much more) glam-tastic items. The shop owner is Lirika Matoshi, who works along with the manager, Ledri Mahmuti. Together, they have created a business like no other! Take a look at these breathtaking fishnet tights and let us know which one you absolutely can not live without. These blue floral designed tights are adorned with a little sparkle to make them really pop. Oh! Look at the little dragonfly on this delicate design! Gorgeous beading and the dark green colour makes you feel like you’re transforming into a forest elf. Can’t decide on a colour? Have them all with these bright eye-catching floral tights! Each bead and flower is hand-sewn in place. You can really feel the love that was put into these! Embrace your inner Poison Ivy with these divinely green pair of fishnet tights! Spring is here, and these let the world know you are ready for the sunshine! Feeling like you’d enjoy something a bit darker? Then these Navy and Black tights are just the thing! Who wouldn’t want a pair of these fairy-inspired starry tights? 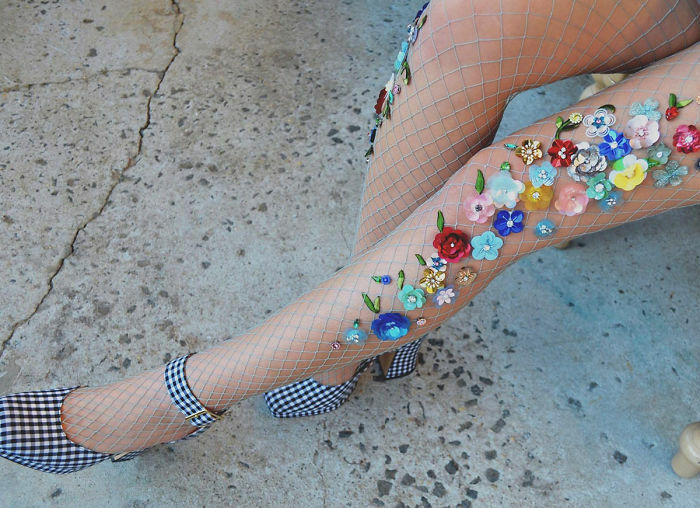 Or if you really want to make a statement, try these iridescent floral tights! 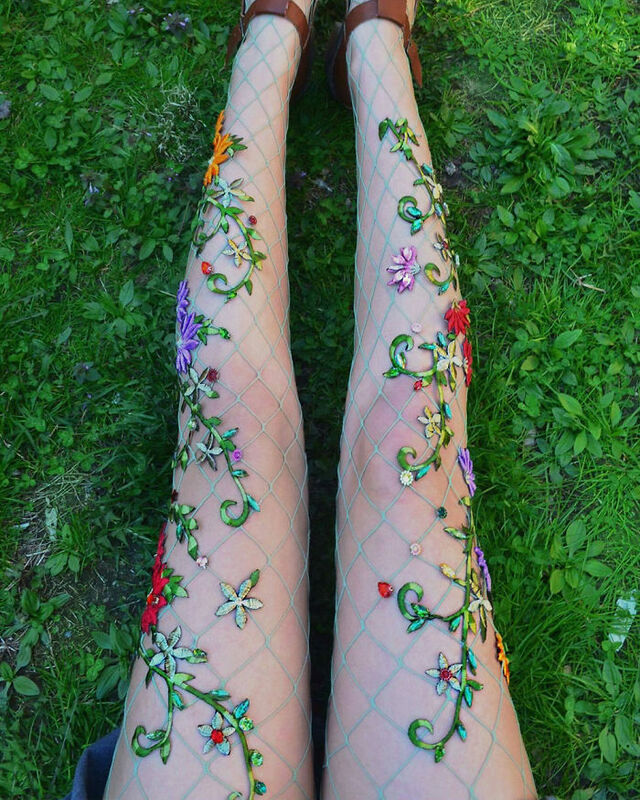 These opalescent garden tights make you feel like you’re in a goddesses garden! Try out these torn-look tights for an interesting twist! Celestial fishnet tights? Take your look to the heavens with these incredible pair! Check out this bejeweled ladybug beetle! The detail is incredible! For more information on these tights, and to get pricing, please check out Lirika Matoshi’s shop on Etsy. All images courtesy of Lirika Matoshi.